We’ve been sharing the news far and wide since we found out, but for those of you who don’t know yet: Columbus is one of the New York Times’ 52 Places to Go in 2019. The article poses the question of Columbus, “Is this the American city of the future?” Of course, we believe it is, and we are tremendously honored to be named in the company of major destinations around the world like Puerto Rico, Hong Kong, Calgary and more. So, what does this mean for planners? Let’s break it down based on the New York Times evidence. “With a revitalized riverfront and booming downtown, Columbus is already one of the nation’s fastest-growing cities.” Columbus is the 14th-largest and fourth-fastest-growing city in the country, as well as the largest city in Ohio and the state’s capital, which provides proximity to powerful government leaders, legislators and influencers who are instrumental in shaping business and economic policy. “It’s poised to become the model for the future of innovative urban transportation, with self-driving shuttles carrying travelers along the Scioto Mile, which recently completed a massive revitalization, adding 33 acres of riverfront green space for festivals, water sports and outdoor art.” In 2016, Columbus won the U.S. Department of Transportation’s Smart City Challenge. Already, smart mobility hubs and a self-driving shuttle have been rolled out and groups can incorporate Smart Columbus into their meetings, but there will continue to be new technology that enhances the visitor experience released in coming years, including a multi-modal trip planning app and event parking management app. The revitalization of the downtown riverfront has made it the center of life in downtown Columbus and the scenic home to many festivals such as the Columbus Arts Festival and the Midwest’s largest PRIDE festival. 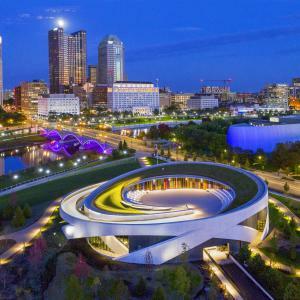 “The newly opened National Veterans Memorial and Museum also sits on the Scioto Peninsula.” Columbus is now the only place in the country to honor all veterans and their families, across all branches of service and from all eras of conflict, in one place. Check out a variety of military experiences to be had in Columbus here. “Among the newest dining options are Veritas, which specializes in small-plate offerings; Service Bar, run by the young chef Avishar Barua, a veteran of New York’s Mission Chinese and WD-50; and in the North Market neighborhood, veggie-forward Little Eater.” Columbus has so much culinary star power that Food & Wine named it one of 32 Places to Go (And Eat) in 2019. The North Market is just one block from the convention center and is a favorite among attendees for getting a quick bite and a feel for the city. Recently, it’s also become a hot spot for events. Check out what Meetings Today has to say about it. 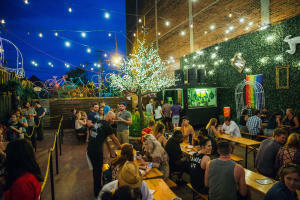 “The ultracool Short North Arts District offers access to the city’s notable local businesses like the new fashion store Thread and the original Jeni’s ice cream store. But don’t skip Italian Village and German Village neighborhoods, where innovators and dreamers have opened destination shops like Stump Plants and Vernacular and bars like Cosecha.” Columbus has five neighborhoods set on a five-mile stretch of High Street, the city’s main thoroughfare, known as the “Five on High.” All are easily accessible either on foot from the Greater Columbus Convention Center (which sits at the center) or via the free CBUS Circulator. Though each have their own unique identity, all are bursting with a diverse mix of restaurants, shops, galleries and more that are sure to surprise and delight attendees. Columbus is the best destination to fight attendee first-tier fatigue. ASAE recognized it when choosing Columbus for its 2019 Annual Meeting & Exposition to be held in August. Will your group be next? Contact us today.